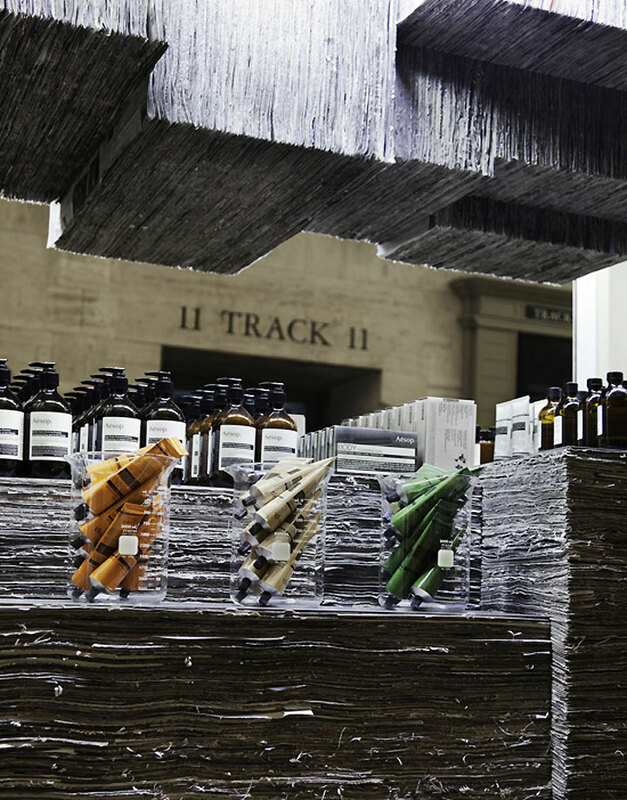 While local culture is a safe, rich and much-used field of inspiration for designers, the Aesop kiosk at Grand Central finds new ways to make even the local element surprising. Determined to connect with New York commuters on a familiar level, the designers use the local newspaper not only as the inspiration for the kiosk, but also as the point of attraction, the surprise element – and the material. 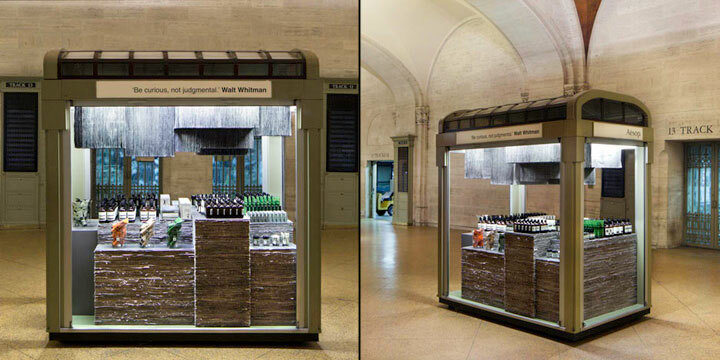 The result of the collaboration between Dennis Paphitis, Aesop director, and Jeremy Barbour from Tacklebox, a Brooklyn-based architecture firm, the kiosk offers a novel way to display the company’s cosmetics, using copies of the New York Times to build counters and decorate the interior of the kiosk. 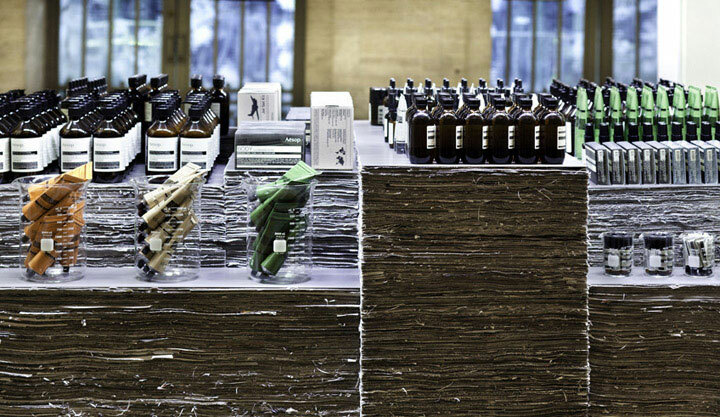 Aesop is well-known for the unique, unconventional designs of its retail spaces, such as the nostalgia-inducing Milanese store or the Covent Garden space with an apothecary feel. This time, the company proves that it can be equally imaginative while working with a much smaller footprint, and create an ingenious design that cannot go unnoticed even by rushing New York commuters. The same structures are used on the ceiling of the kiosk, as sculptural bodies reminiscent of chandeliers. Combined with the transparency of the glass containers in which some of the cosmetic items are presented, the newspapers create a display that comes across as both familiar and exotic. It is, in fact, a different way of showing respect for the written word. 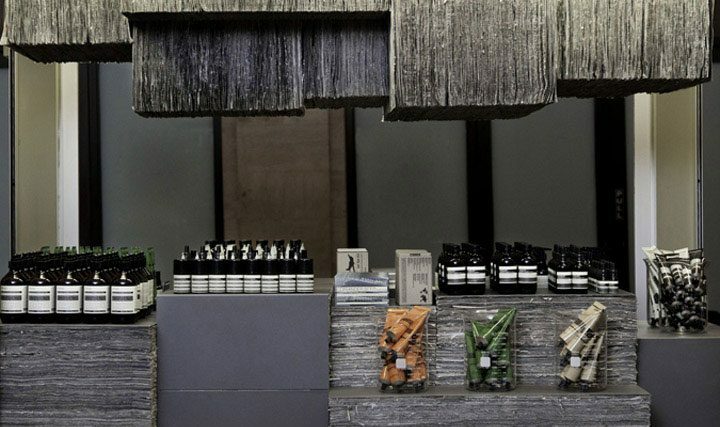 Aesop talks about the desire to pay tribute to the local history of each city to which the company brings its stores. The mere quantity of newspaper pages that make up the kiosk’s counters hold a historical suggestion of how the written word plays a role in the New York culture, past and present.